Ask any marketer what their biggest pain point is, and the majority will tell you it's measuring ROI from social media. It's not that there's a shortage of social media data. Most networks provide a stack of insights and metrics. It’s deciding what data you need and then reporting it in a meaningful way to key stakeholders. If that's you, then stay tuned. 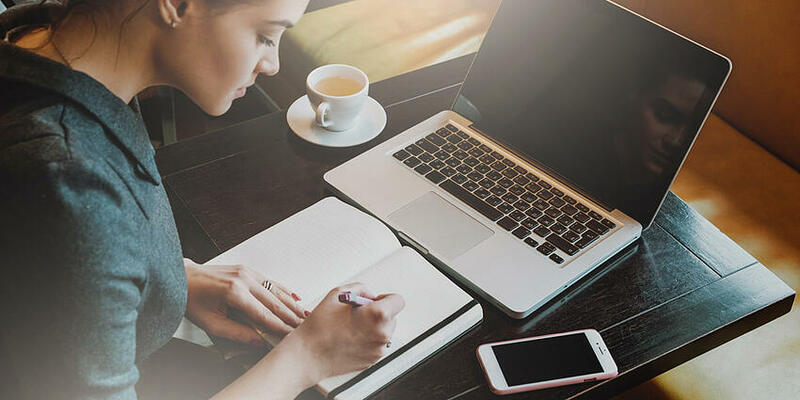 In this article, you'll discover what goals and metrics you can gather and report on so that everyone can see the ROI of your social media efforts. 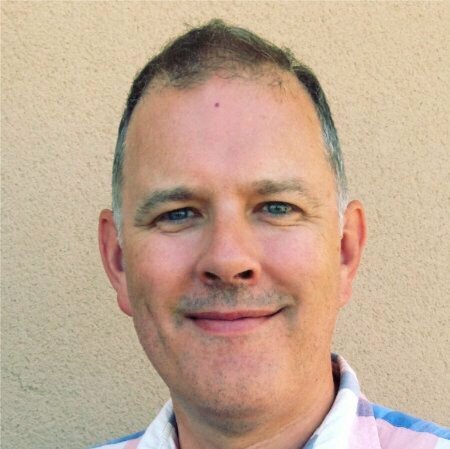 What social media data should you gather? As a marketing manager, you need to decide what social media data you want to use in your reports. And this decision should be driven by the specific social media strategies and goals for your brand. #1 - You want to increase exposure for your new brand and want to know how many new followers you're attracting and engaging on social media. In this situation, you could collect data from each social network that shows how users view and engage with your content and your accounts. And then generate a comparison report to see which platform performs best. #2 - You use social media for your SaaS offering and want to know which posts on which networks are generating the most leads. For the second scenario, you'll need to use Google Analytics with UTM values to track the website activity originating from each social media network. 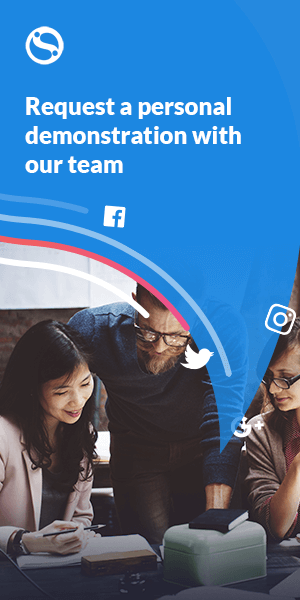 #3 - You provide customer service via social media and want to measure how fast your team responds to queries, and how engaged your followers are. For scenario three, you'll have to create a custom report that combines data from a few different sources, and consider a paid tool. There's plenty of available data - just decide what you want to track. How are you going to track growth? As well as collecting the data, you'll need to decide how you're going to measure results and track growth. For example, you'll need to consider what timeframe to use: Weekly, Monthly, Quarterly, Annually or by Individual Campaign. Comparing stats for a chosen period with stats for the previous period, e.g., November 2018 and October 2018. Comparing stats for a chosen period with stats from the previous year, e.g., November 2018 and November 2017. Checking the metrics for a campaign, with no previous history considered; e.g., the product launch campaign. When you know your business goals, you can define your KPIs (key performance indicators), gather the applicable data, and report your results. Once you're clear on what you want to measure, you'll need to start collecting the data and producing your reports. 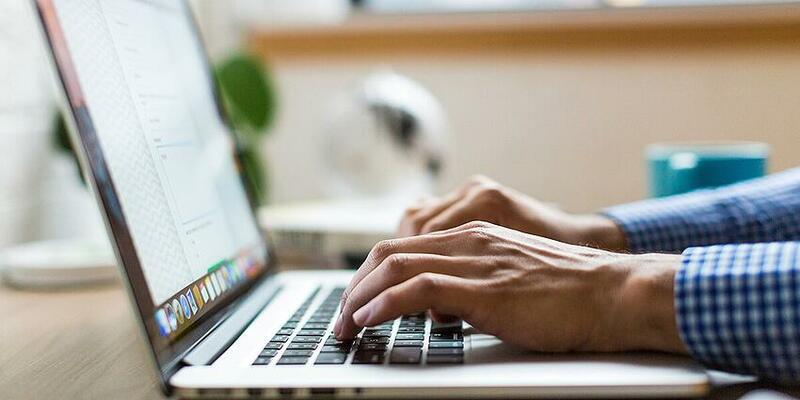 In this section, you'll learn how to gather and report on the data from the native social networks, Google Analytics, and Sendible's reporting suite. Each social network provides insights and analytics to help you understand how your brand is performing. Let's take a look at some of the metrics available on each platform. 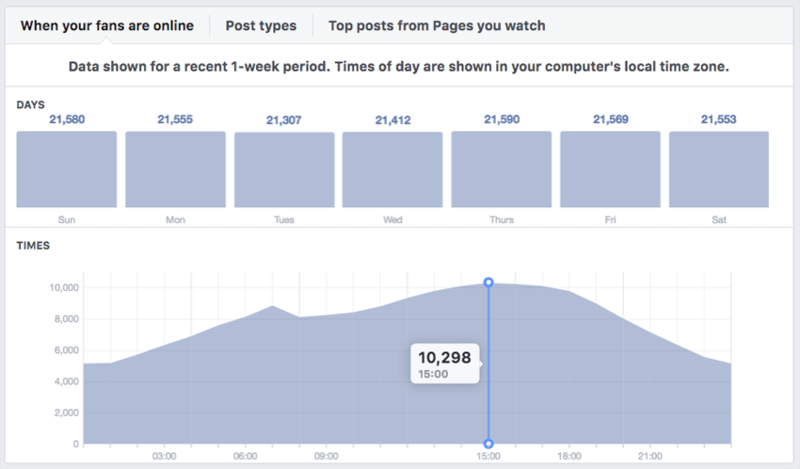 Facebook Insights provides a wealth of data to help you understand your audience engagement broken down into several sections. 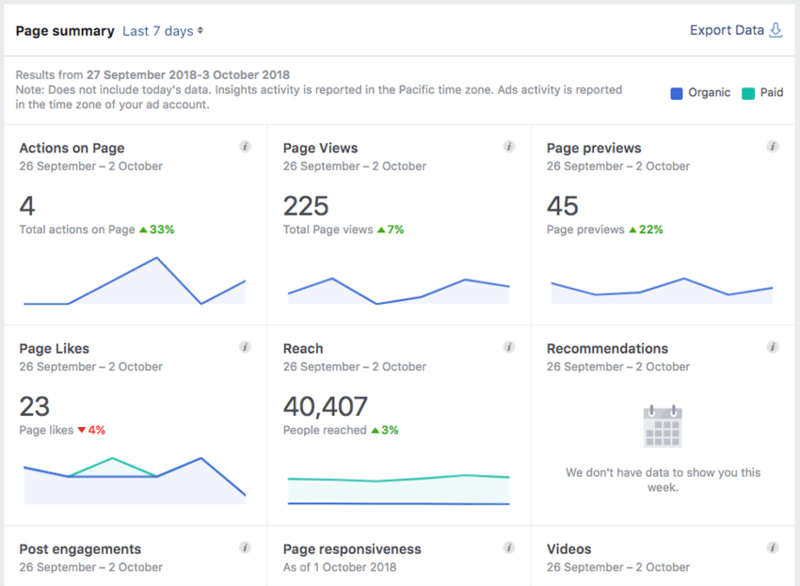 You can find plenty of information on your reach, engagement metrics (likes, comments, shares and clicks), as well as how your posts are performing in general. Perhaps the most valuable area in Facebook Insights is the Posts section where you can see a comparison for all of your published posts. Here, you can quickly see which types of posts are generating the most engagement, and what kind of impact paid advertising is having on reach. Here's a selection of key metrics. Page Likes - Total and new likes for your Page. Post Reach - The number of unique people who saw your Page and posts. Engagement - The number of unique people who engaged with your Page. Page Likes - The total Page likes for each day, over a 28-day period. Net Likes - The number of new likes minus the number of unlikes. Where Your Page Likes Happened - The number of times your Page was liked, broken down by where it happened. Post Reach - The number of people your post was served to, both paid and organic. Likes, Comments, and Shares - The positive engagement. Hide, Report as Spam, and Unlikes - The negative engagement. Total Reach - The number of people who were served any activity from your Page. When Your Fans Are Online - Shows you when the people who like your Page are on Facebook. Posts Types - Displays the success of different post types based on average reach and engagement. Minutes Viewed - The total number of minutes your videos were played. 3-Second Video Views - The number of times your videos were viewed for 3 seconds or more. Top Videos - The highest performing videos viewed by minutes within the selected date range. *Note: In the Overview section, Facebook allows you to export up to 500 posts at a time by selecting the data type, date range and file format. 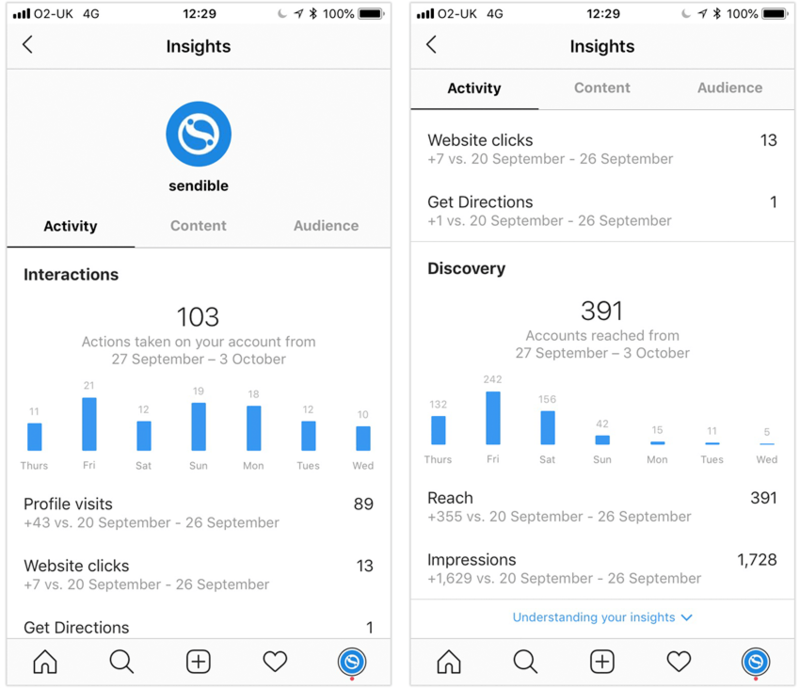 Instagram Insights is split across three tabs - Activity, Content, and Audience - and covers your overall account plus individual posts and stories. 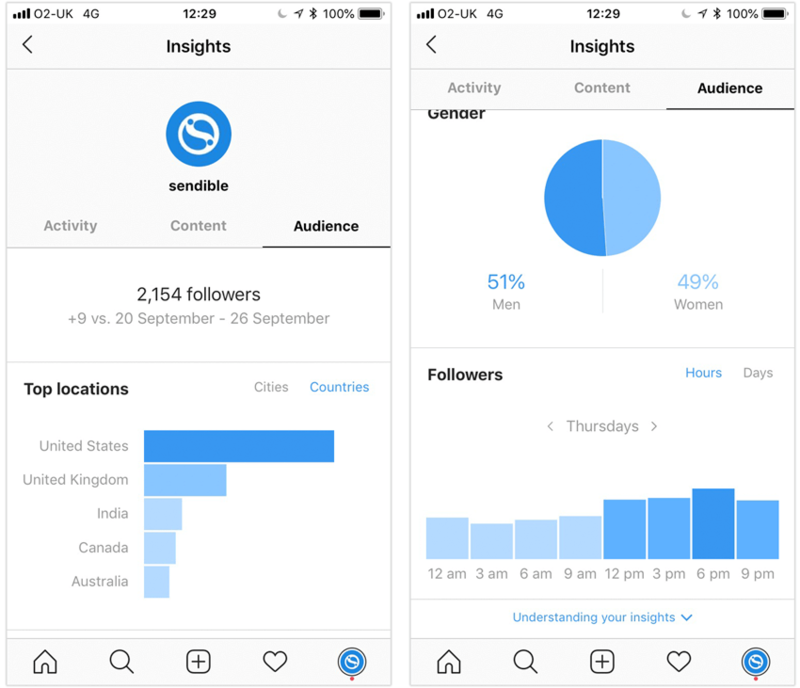 Currently, there are no insights for Live broadcasts, and, like everything else on Instagram, the Insights are only accessible on mobile devices, which can be frustrating at times. Let's take a look at what's available. 1 - The Activity tab has two sets of data: Interactions and Discovery. These insights focus on your overall account activity over the past 7 days. Profile visits - The number of users that have visited your profile. Website clicks - The number of clicks on the website link in your profile bio. Email - The number of times users have tapped on Email in your profile. Call - The number of times users have tapped on Call in your profile. Reach - The number of unique accounts who viewed any of your content. Impressions - The total number of times that all of your posts have been seen. 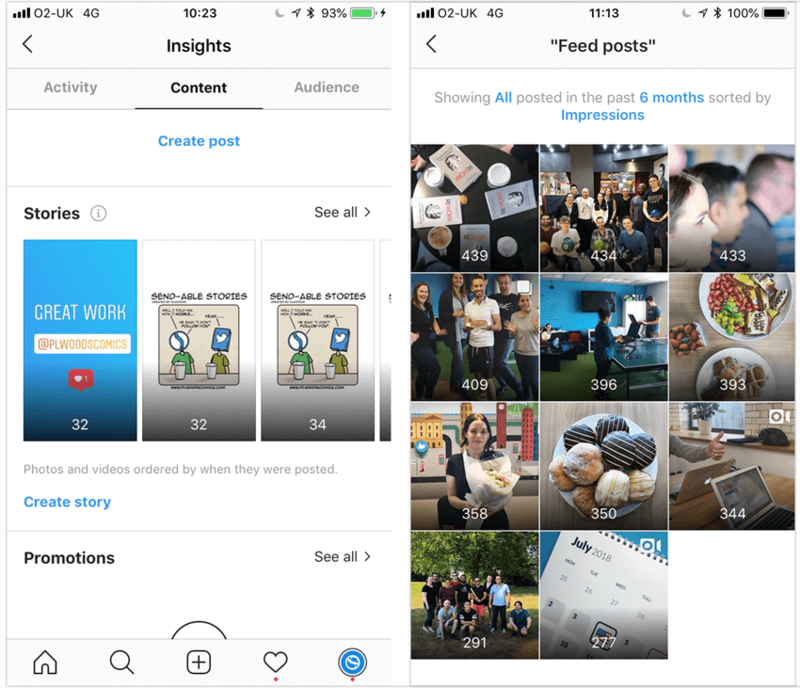 2 - The Content tab has sections for Posts, Stories, and Promotions, with filters to pinpoint the data you want. Website clicks, Calls, Comments, Emails, Engagement, Follows, Get directions, Impressions, Likes, Profile visits, Reach, Saved, Texts, Views. You can order your posts based on any of the above metrics, which allows you to zoom in on specific data to see your best performing content. Plus, you also have the option to analyze further by tapping on individual posts and viewing their insights. 2b - The Stories section has a different set of metrics to reflect its unique style, and will only show you results from 14 days ago, as well as 7 days and 24 hours. Impressions - The number of times your story was seen. Reach - The number of unique accounts that saw your story. Forwards - The number of times someone taps to skip to the next piece of your story. Back - The number of times someone taps to go back to a previous piece of your story. Exited - The number of taps to leave your story. Replies - The number of times people send messages to your story. Next Story - The number of taps to the next account’s story. Link opens - The number of times that this link was opened. 2c - The Promotions section allows you to create and view paid promotions that are created directly on Instagram. Note that if you choose to set up a promotion, you will be redirected to Facebook to confirm your payment details before you can start designing the ad. Once done, you will be directed back to Instagram where you can finish creating your promotion. Note that if you are running Facebook Ads which also show on Instagram, these will not appear in this section, which is a bit of a shame. Top locations - The location of your followers, by city or country. Age range - The age bracket of your followers. Gender - The percentage split of your followers. Followers - The active times of your followers, by hours and days. *Note: Unfortunately, you can’t export insights from Instagram at this time. The other options include the Events tab which provides data on other brands events, which is useful if you’re planning a similar campaign. The More tab provides insights on your video activity and, if applicable, any website conversion tracking you might run for Twitter Ads. Tweets - The number of Tweets you sent. Tweet Impressions - The number of times your Tweets were viewed. Profile visits - The number of visits to your Twitter profile. Mentions - The number of Tweets mentioning you. Followers - The number of followers you have. You can also look back at previous calendar months to discover your top influencers and content. Interests, such as technology, photography, and news. Demographics, such as language, gender, and location. *Note: Twitter lets you export your Tweet activity data in CSV format for further analysis from the Tweets dashboard. LinkedIn Analytics lets you track trends across various metrics and time periods in three main categories. Traffic metrics - The number of page views and unique visitors. Visitor demographics - Filter by job function, location, seniority, industry, and company size. Impressions - The number of times your update was visible to other members. (A member is a signed-in user). Unique impressions -The number of times your updates were shown to unique members. Clicks - The number of clicks on a post, company name or logo, not including interactions. Likes, Comments, shares - the number of interactions on your content. Social engagement % - The number of interactions, plus the number of clicks and followers acquired, divided by the number of impressions. Follower highlights - The number of total, organic, and acquired followers. Follower gains - The change in the number of followers over time. Follower demographics - The background of your followers, including Location, Job function, Seniority, Industry, and Company size. Companies to track - LinkedIn also shows you how your followers compare to other similar companies (pre-selected by LinkedIn) with the following metrics: Total followers (all time), Follower growth, Number of updates, Social engagement. *Note: You can export your LinkedIn Analytics reports individually in XLS format for further analysis. Google Analytics allows you to extend your data capture by tracking your website activity. For instance, you can see from which networks your visitors came, how long they stayed on your site, check which content they downloaded, and much more. Let's take a look at a few metrics you could track. Sessions - The number of times when users are active on your site. New sessions - The number of new users compared to returning users. New users - The number of users coming to your site for the first time. Bounce Rate - The percentage of users leaving your site after a single page view. Pages / Session - The average number of pages a user views each session. Average Session Duration - The average time users spend on your site per visit. Goal Conversion Rate - The percentage of conversions per channel. Goal Completions - The total number of conversions. Goal Value - The value of each conversion. The above metrics are all valid starting places for tracking overall website activity. But with Google Analytics, you can drill down further to get specific social media reports. 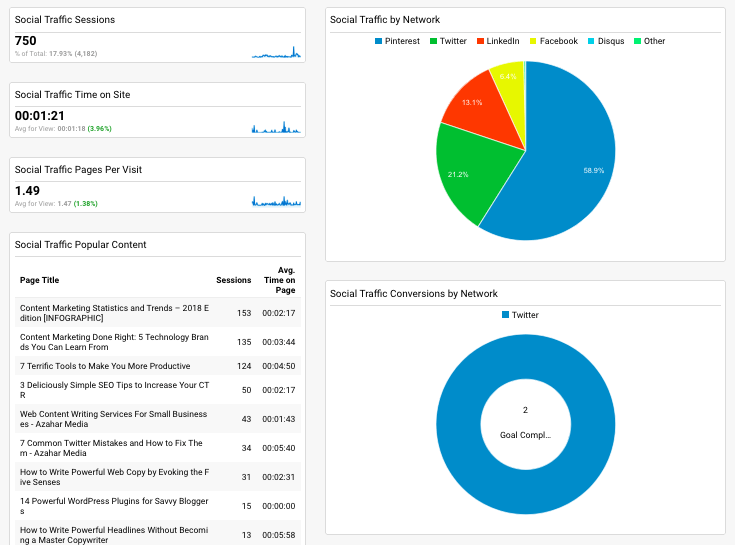 Pro Tip: Here’s a guide to proving social media ROI and building your custom dashboard. Source - Where the traffic is coming from; e.g. Instagram, Facebook, Twitter. Medium - How the traffic is coming to your website; e.g. social media, email. Campaign - Why the traffic is coming to your website; e.g. the 'Product Launch Promo' campaign. The best way to prove your ROI in Google Analytics is to use Goals and Conversions. 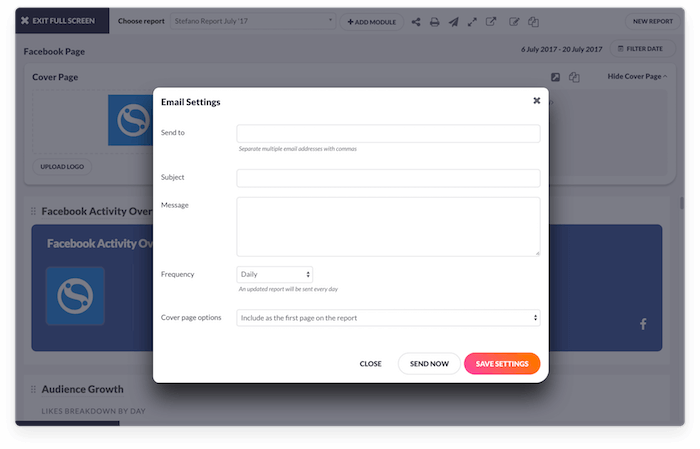 You can create goals to track different leads such as newsletter subscribers, contact form submissions, content downloads, product trial signups, and, ultimately, new customers. This way, you can learn much more about the anonymous traffic on your website to further optimize it. So far, you've seen metrics and insights from the native social media networks and Google Analytics. These data sources are all valid and useful when reporting on your successes. But what if there was a way to combine the best of these sources in one place? That's one of the benefits of using Sendible's reporting suite. 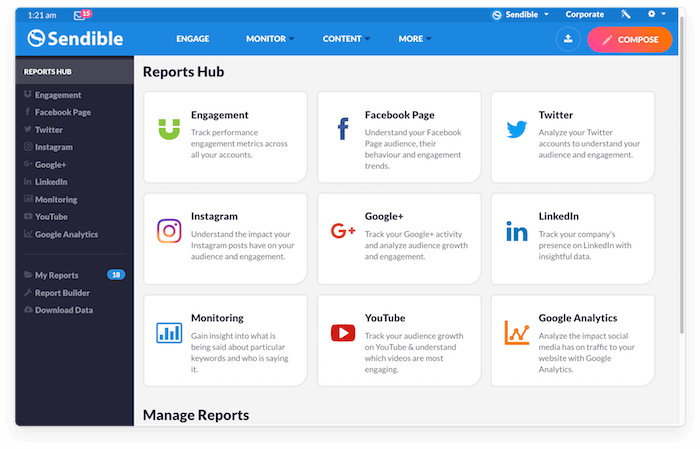 The Reports Hub is available on all plans and gives you nine ready-to-go social media reports for an instant snapshot of your social data. 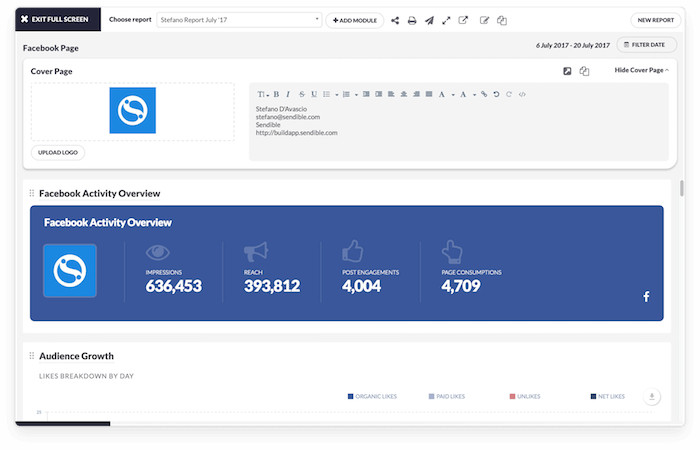 The area includes one overall 'Engagement' report that provides insights into your combined audience, post engagements, posts, and mentions across all the channels you manage. It's great for making comparisons and spotting trends without having to visit each network separately, plus it has a hook to Google Analytics as well! Download a sample of the Sendible reports to learn more. Finding and gathering social media data to use in your reports should not be a problem when you know what you're looking for. Once you've decided on how you're going to track and report growth for your brand, you can extract the correct data from the best sources and report on your performance. As Jay Baer says: "Just figure out what you want to track, where you can track it, and go do it." Previous story How Far Ahead Should You Schedule Your Social Media Posts?